This classification was further subdivided, so cuffless perilaryngeal sealers could be either ‘directional’ or ‘non-directional’, and cuffed pharyngeal sealers could be designated as ‘with’ or ‘without’ oesophageal sealing. The sealing mechanisms were described in detail, in conjunction with force vectors, frictional force and whether a device was reusable or single-use; or incorporated a mechanism to provide additional protection against aspiration. Whatever the merits of this system, it now appears unnecessarily complex, although to be fair, Miller’s objective was limited to providing a consistent method for evaluating and understanding the mechanisms of action of any given SAD. In the same paper, Miller provided a provisional scoring of airways, which suggested a number of desirable features appropriate for a SAD for routine use in anaesthesia. This included easy insertion by a non-specialist, stable airway once positioned, sufficient sealing quality to apply positive pressure ventilation, a good first-time insertion success rate, minimal associated risk of aspiration, and minimal risk of cross-infection and serious side effects. These attributes remain valid today, although to this list we could probably now add latex free and atraumatic, requiring minimal training for safe and effective use, incorporation of a bite block, MRI compatibility, and perhaps suitability for use as a conduit for intubation. Cuffed oropharyngeal airway, where the ventilatory opening is located at the base of the tongue and a sealing surface is located in the oropharynx. Laryngeal masks, where the ventilatory opening is surrounded by the cuff, which forms a seal with the periglottic tissues. The ventilatory opening and the cuff seal usually represent the most distal portion of the device. Pharyngeal or pharyngeal-esophageal tube, where a cuff surrounds the ventilatory tube in a circumferential fashion and is located proximal to the ventilatory opening. This design compartmentalizes the pharynx, with the cuff serving as a sealing divider between the proximal and distal pharyngeal compartments, and the ventilatory opening(s) are located in the distal pharyngeal compartment. Pharyngeal airway liner, which is represented by the streamlined liner pharyngeal airway (SLIPATM). This is a shell-like device that, upon insertion, expands the soft tissues of the neck. The tension of the elastic neck soft tissues that surround the device provides the sealing mechanism. The ventilatory opening is located within the shell in the periglottic area. Device with a soft, gel-like, non-inflatable cuff and widened, concaved buccal cavity stabiliser. The sealing mechanism is created by the soft non-inflatable cuff accurately mirroring the anatomy of the laryngeal inlet to create an impression fit, without the need for cuff inflation. This classification did little to reduce complexity. In the same year as ISO 11712 was published, White, Cook and Stoddart, in a review article published in ‘Pediatric Anesthesia’, entitled, A critique of elective pediatric supraglottic airway devices categorised SADs into 1st and 2nd generation devices. 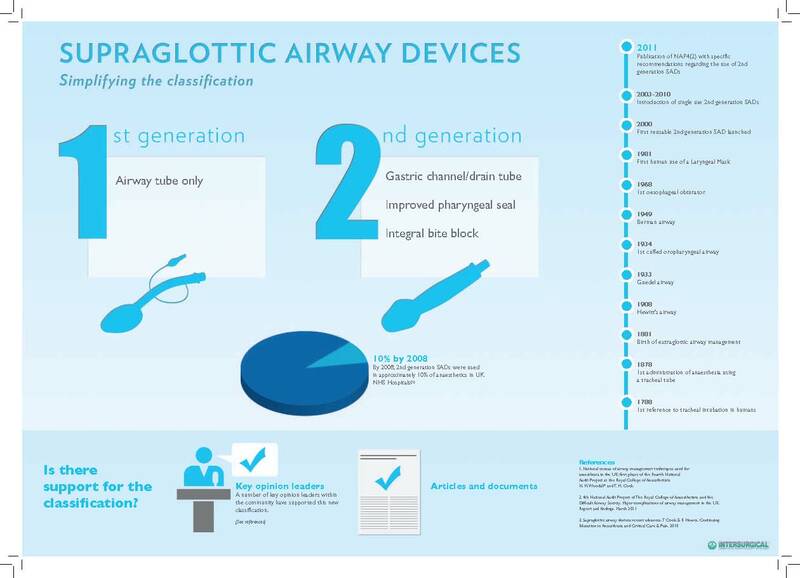 A 1st generation device was described as a ‘simple airway tube’ and 2nd generation as a device that ‘incorporates specific design features to improve safety by protecting against regurgitation and aspiration’. I am not sure if this was the first published description of this method of classification, but its simplicity had immediate appeal, and it quickly became established as the most popular method for classifying SADs. It has since been used in numerous published clinical studies, review articles and conference lectures and a number of recommendations regarding use of 2nd generation devices were made in the 4th National Audit Project of the Royal College of Anaesthetists (RCoA) and The Difficult Airway Society (DAS) report, Major complications of airway management in the United Kingdom. Of course, 2nd generation devices are not all the same, so the clinical evidence for each device regarding safety and efficacy still needs to be reviewed and assessed individually. Designation as a 2nd generation device does not in itself confirm superiority of performance, but the classification does provide useful information about basic product design characteristics, such as whether the device incorporates a mechanism for the management of regurgitant fluid. In conclusion, although initial classifications of SADs provided some useful information, they were also complex, and as a result never really obtained widespread use or acceptance. The more recent classification of SADs into 1st or 2nd generation devices has proved popular, is widely used and provides valuable information regarding basic product design. Safety and efficacy of individual devices still needs to be reviewed and assessed individually. A basic diagram highlighting the differences between 1st and 2nd generation devices is shown below (Fig 1). An Infographic, with additional background information, is also available (Fig 2). Please contact me if you would like a pdf copy of the infographic.